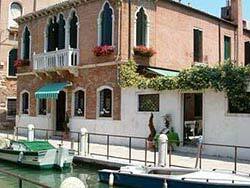 ABOVE: The Hotel Messner is on the Fondamenta de Ca' Bala, which runs along the east side of the Fornace Canal. INSET BELOW: A close-up of the hotel's Venetian Gothic architecture, and outdoor tables at the Messner's restaurant. Location: In the eastern half of Dorsoduro, near the Santa Maria della Salute Church and the Peggy Guggenheim Collection. Closest Alilaguna Airport Boat stop: Zattere. You want to stay in a Champagne neighborbood at prosecco rates. The eastern section of Dorsoduro is mostly a quiet, upscale neighborhood where you're more likely to find art galleries and antique dealers than souvenir shops. The Hotel Messner is a rarity in such surroundings: an affordable hotel that's just a short distance from some of Venice's best views (such as a panoramic view of the Piazza San Marco, the island church of San Giorgio Maggiore, and the island of La Giudecca from the Punta della Dogana at the tip of Dorsoduro). The hotel began its life in 1940, when Maria Messner turned her small palazzo into an inn for students, teachers, and travelers. Over the years, the inn became a guesthouse and then a hotel, with a restaurant for hotel guests and residents of the neighborhood. In the first satellite image, look for the Fondamenta de Ca' Bala in Dorsoduro (the land mass that comes to a point on the south side of the Grand Canal). The Hotel Messner is about a third of the way down the canal. Other major landmarks in the photo include the Accademia Bridge (left) and the Piazza San Marco (upper right). In the close-up photo, which looks to the east, you'll see the Fondamenta de Ca' Bala near the bottom of the frame. The hotel is behind the word "Bala." To the north, you can see the Santa Maria della Salute Church and the Punta della Dogana with its spectacular views. The nearest vaporetto or waterbus stop is Salute (next to the church), which is one stop away from San Marco on the opposite side of the Grand Canal.